NEW YORK – The commander of the U.S. Pacific Fleet, Adm. Harry B. Harris, Jr., was honored this week for his lifetime contributions to national security in two separate events that celebrate diversity and the accomplishments from those of different cultures. On May 6, Harris accepted the Asian American Institute for Congressional Studies (APAICS) Lifetime Achievement Award in Washington, D.C., and on May 10 he received an Ellis Island Medal of Honor Award from the National Ethnic Coalition of Organizations (NECO) in New York. The awards embody the significant contributions that each recipient has made all while maintaining the traditions of their respective ethnic backgrounds. Harris, who is of Japanese-American descent and is the highest-ranking Asian-American officer in Navy history, accepted each on behalf of the Navy, acknowledging the many opportunities he has been afforded throughout his career. According to each respective organization, Harris follows a long line of accomplished recipients at all levels of service, professions, and from all walks of life. 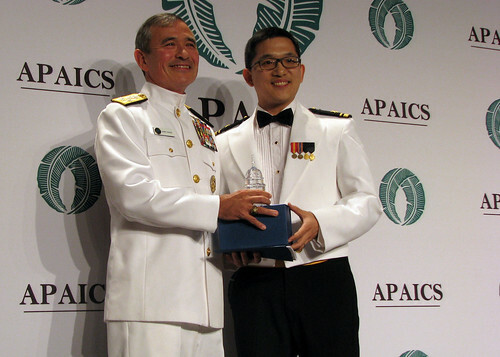 Former recipients of the APAICS Lifetime Achievement Award include former Sen. Daniel K. Inouye, Rep. Michael M. Honda, and retired Rear Adm. Ming Chang. Past Ellis Island Medal of Honor recipients include former Gen. Norman Schwarzkopf, retired Gen. and former Secretary of State Colin Powell, former Secretary of State Hillary Rodham Clinton, Sen. John McCain and Nobel Prize awardee Elie Wiesel. It is especially meaningful that the awards come in the month of May, where America recognizes the service and dedication of the men and women of Asian-American and Pacific Islander heritage. May honors the diversity that is central to the Navy’s identity and critical to advancing its role in maintaining peace and stability around the world. Today’s Navy includes approximately 19,000 uniformed personnel and more than 29,000 civilians of Asian-American and Pacific Islander heritage. According to Harris, their contributions to America’s security and freedom continues a tradition of outstanding Asian-American and Pacific Islander service in the Navy. “This is a history punctuated with stories of trailblazing heroism from Sailors that exemplify the best of who we are,” Harris explained. “This month reminds us that the true source of America’s greatness lies not in the power of our weaponry, but in the courage of those who serve. “I am proud to receive these awards on behalf of them and on behalf of our Navy,” he concluded.